You are here: Home » How Good was the Pilot of the Luke Fischer Show? December 26, 2014 | Ryan Jackson | Comments Off on How Good was the Pilot of the Luke Fischer Show? How Good was the Pilot of the Luke Fischer Show? In short, it was the best debut Marquette fans have seen in at least 14 seasons, possibly longer. Since the 2000-2001 season, 72 different players have donned the Marquette uniform and logged at least one minute of game time. During these 14 seasons, Marquette fans have witnessed the debuts of some of their greatest players. Included on the list are 5 of the top 10 career scorers (Jerel McNeal, Lazar Hayward, Dominic James, Travis Diener, and Wesley Matthews), one of the top 5 career rebounders (Hayward), player with the second highest career scoring average (Dwyane Wade), top two career 3-point shooters (Steve Novak and Diener), three of the top 7 assist men (James, Diener, and McNeal) three of the top 10 shot blockers (Scott Merritt, Ousmane Barro, and Chris Otule), and four of the top 10 steals leaders (McNeal, James, Hayward, and Diener). Some of the greatest players in Marquette history have started their careers during this great decade and a half of Golden Eagle hoops. Luke Fischer’s debut was better than every last one of them. 13.21 minutes, 4.47 points, 2.44 rebounds, 1.08 assists, 0.51 steals, 0.375 blocks, 1.01 turnovers, 1.64 fouls, 1.57 FGM, .343 FG%. Clearly Luke far outpaced the average. He was well above the mean in points, rebounds, blocks, turnovers, FGM, and FG%. In fact, he actually ranked number one in several categories. Fischer had more minutes, points, rebounds, blocks, and FGM in his debut game than any other Marquette player of the last 14 seasons. He is a category leader five times over. If that wasn’t enough, he is also second in FG% (min. 4 FGA) trailing only Davante Gardner who went 7/7 from the field against Prairie View A&M back in 2010. To give some context (and to have a little fun), here is a list of the top 10 Marquette debuts since the 2000-2001 season. What can be taken away from this list (besides that Rice and Prairie View A&M are apparently great teams to have debuts against) is that pilot performances are typically not a player’s greatest outing. They tend to be low scoring affairs where the new player spends more time trying to keep up rather than producing. It takes a really special player (or Dan Fitzgerald…apparently) to come in and make an impact from day one. On this list of 10, five made it to the NBA, two made it to the D-league, one has the talent (but not the body) to be in the NBA, and the others played in Europe. While it may be too early to tell what Fischer’s career as a Golden Eagle will look like, it is safe to say that he is in the company of greatness. 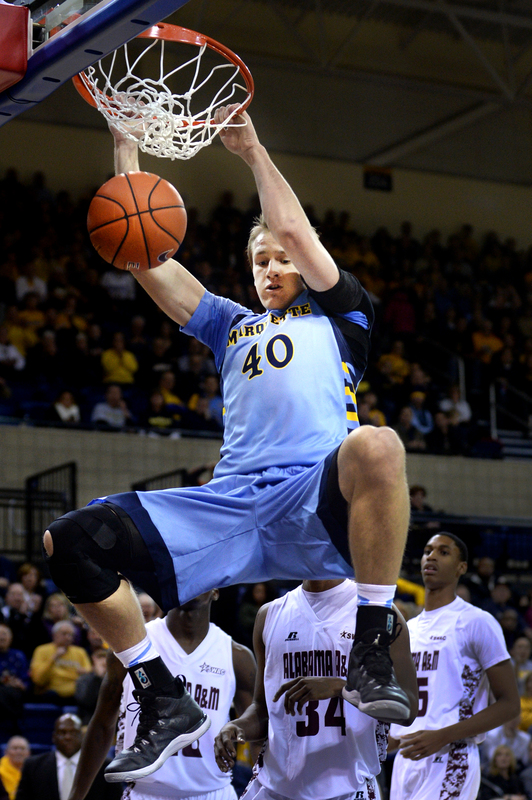 Luke’s debut was quite the early Christmas present for Marquette fans. Let’s hope it becomes the gift that keeps on giving.